Strong winds across Indiana and Illinois whipped a fresh layer of snow into balls - some as big as hay bales - that most folks had never seen the likes of. Lenora Dodd, who lives about 30 miles south of Indianapolis, did a double take when she looked out her bathroom window Wednesday and saw a snowball roll up by itself. Later, she and a neighbor went outside to inspect the thing. "I'm 66 and she's 77," Dodd said, "and we've never seen anything like it." Called "rollers" by meteorologists, the formations are usually found in arctic regions because they need the right combination of wind speed, temperature and snow condition to form. "It's the same sort of idea as when you make a snowman, but the wind is doing all the work, because it's so strong," Jason Puma, a meteorologist with the National Weather Service in Indianapolis. 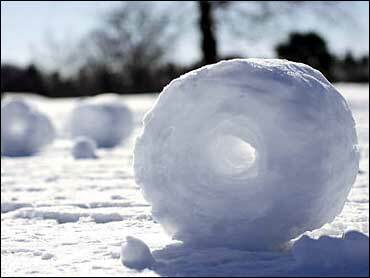 The wind was so strong - up to 60 mph in some parts of Illinois - that the snow rollers bounced across fields like tumbleweeds. "At first I thought they were just clumps of sod being turned over in the field," said Stacy Bowman of Springfield, Ill. "Then I thought maybe some kids were out there, but I didn't see any footprints around." Rollers can range widely in size - from the size of a golf ball to a 30-gallon drum. The largest one John Percifield found near his home in southeastern Indiana measured 14 inches wide and 12 inches in diameter. He was so amazed he even took one to his radiator repair shop to show his employees. "And the silly things are pretty well-packed," he said.